Considerable care is necessary in the design of bearings when selecting appropriate ball and bearing race radii. If the radii are too similar the area of contact is large and excessive wear and thermal stress (from frictional heating) results. If the radii are too dissimilar then the contact area is very small, local compressive stresses become very high and the load capacity of the bearing is reduced. As a compromise between these extremes the radius of the race is normally taken to be between 1.03 and 1.08 times the ball radius. Fatigue life tests and service history then indicate that the life of ball bearings varies approximately as the cube of the applied load whereas, for roller bearings, a 10/3 power relationship is more appropriate. These relationships can only be used as a rough "rule of thumb", however, since commercially produced bearings, even under nominally similar and controlled production conditions, are notorious for the wide scatter of fatigue life results. As noted previously, the majority of bearing failures are by spalling of the surface and most of the comments given in §10.1.6 relating to gear failures are equally relevant to bearing failures. It is probably true to say that all engineering components contain stresses (of variable magnitude and sign) before being subjected to service loading conditions owing to the history of the material prior to such service. These stresses, produced as a result of mechanical working of the material, heat treatment, chemical treatment, joining procedure, etc., are termed residual stresses and they can have a very significant effect on the fatigue life of components. These residual stresses are "locked into" the component in the absence of external loading and represent a datum stress over which the service load stresses are subsequently superimposed. If, by fortune or design, the residual stresses are of opposite sign to the service stresses then part of the service load goes to reduce the residual stress to zero before the combined stress can again rise towards any likely failure value; such residual stresses are thus extremely beneficial to the strength of the component and significantly higher fatigue strengths can result. If, however, the residual stresses are of the same sign as the applied stress, e.g. both tensile, then a smaller service load is required to produce failure than would have been the case for a component with a zero stress level initially; the strength and fatigue life in this case is thus reduced. Thus, both the magnitude and sign of residual stresses are important to fatigue life considerations, and methods for determining these quantities are introduced below. It should be noted that whilst preceding chapters have been concerned with situations where it has been assumed that stresses are zero at zero load this is not often the case in practice, and great care must be exercised to either fully evaluate the levels of residual stress present and establish their effect on the strength of the design, or steps must be taken to reduce them to a minimum. Bearing in mind that most loading applications in engineering practice involve fatigue to a greater or less degree it is relevant to note that surface residual stresses are the most critical as far as fatigue life is concerned since, almost invariably, fatigue cracks form at the surface. 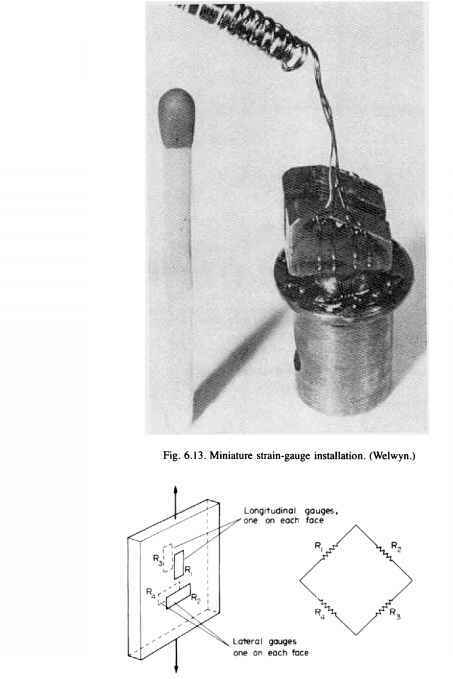 The work of §11.1.3 indicates that whilst tensile mean stresses promote fatigue crack initiation and propagation, compressive mean stresses are beneficial in that they impede fatigue failure. Compressive residual stresses are thus generally to be preferred (and there is not always a choice of course) if fatigue lives of components are to be enhanced. Indeed, compressive stresses are often deliberately introduced into the surface of components, e.g. by chemical methods which will be introduced below, in order to increase fatigue lives. There are situations, however, where compressive residual stress can be most undesirable; these include potential buckling situations where compressive surface stresses could lead to premature buckling failure, and operating conditions where the service loading stresses are also compressive. In the latter case the combined service and residual stresses may reach a sufficiently high value to exceed yield in compression and produce local plasticity on the first cycle of loading. On unloading, tensile residual stress "pockets" will be formed and these can act as local stress concentrations and potential fatigue crack initiation positions. Such a situation arises in high-temperature applications such as steam turbines and nuclear plant, and in contact load applications. Whilst it has been indicated above that tensile residual stresses are generally deleterious to fatigue life there are again exceptions to this "rule", and very significant ones at that! It is now quite common to deliberately overload structures and components during proof testing to produce plastic flow at discontinuities and other stress concentrations to reduce their stress concentration effect on subsequent loading cycles. Other important techniques which involve the deliberate overloading of components in order to produce residual stress distribution favourable to subsequent loading cycles include "autofrettage" of thick cylinders (see §3.20(a)), "overspeeding" of rotating discs (see §3.20(b)) and pre-stressing of springs (see §3.8). Whilst engineers have been aware of residual stresses for many years it is only recently that substantial efforts have been made to investigate their magnitudes and distributions with depth in components and hence their influence on performance and service life. This is probably due to the conservatism of old design procedures which generally incorporated sufficiently large safety factors to mask the effects of residual stresses on component integrity. However, with current drives for economy of manufacture coupled with enhanced product safety and reliability, design procedures have become far more stringent and residual stress effects can no longer be ignored. Principally, the designer needs to consider the effect of residual stress on structural or component failure but there is also need for detailed consideration of distortion and stability factors which are also closely related to residual stress levels. Residual stresses generally arise when conditions in the outer layer of a material differ from those internally. This can arise by one of three principal mechanisms: (a) mechanical processes, (b) chemical treatment, (c) heat treatment, although other mechanism are also discussed in the subsequent text. The most significant mechanical processes which induce surface residual stresses are those which involve plastic yielding and hence "cold-working" of the material such as rolling, shot-peening and forging. Practically all other standard machining procedures such as grinding, turning, polishing, etc., also involve local yielding (to a lesser extent perhaps) and also induce residual stresses. Reference should also be made to §3.9 and §3.10 which indicate how residual stresses can be introduced due to bending or torsion beyond the elastic limit. Shot peening is a very popular method for the introduction of favourable compressive residual stresses in the surface of components in order to increase their fatigue life. It is a process whereby small balls of iron or steel shot are bombarded at the component surface at high velocity from a rotating nozzle or wheel. It is applicable virtually to all metals and all component geometries and so is probably the most versatile of all the mechanical working processes. The bombardment tends to compress the surface layer and thus laterally try to expand it. This lateral expansion at the surface is resisted by the core material and residual compression results, its magnitude depending on the size of shot used and the peening velocity. Typically, residual stresses of the order of half the yield strength of the material are readily obtained, with peak values slightly sub-surface. However, special procedures such as "strain peening" which bombard the surface whilst applying external tensile loads can produce residuals approaching the full yield strength. The major benefit of shot peening arises in areas of small fillet radii, notches or other high stress gradient situations and on poor surface finishes such as those obtained after rough machining or decarburisation. It is widely used in machine parts produced from high-strength steels and on gears, springs, structural components, engine con-rods and other motor vehicle components when fatigue lives have been shown to have been increased by factors in excess of 100%. A number of different peening procedures exist in addition to standard shot peening with spherical shot, e.g. needle peening (bombardment by long needles with rounded ends), hammer peening (surface indented with radiused tool), roller-burnishing (rolling of undersized hole to required diameter), roto peening (impact of shot-coated flexible flaps). Figure 10.7 shows a typical residual stress distribution produced by shot peening, the maximum residual stress attainable being given by the following "rule of thumb" estimate am ~ 500 + (0.2 x tensile strength) for steels with a tensile strength between 650 MN/m2 and 2 GN/m2.